If it’s a bright, clear day outside, you may find yourself reaching for sunglasses. Sunglasses are fashion statements but they are also as protective as they are fashionable. 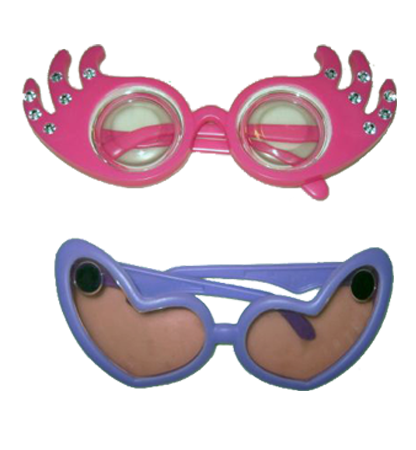 Sunglasses are eyewear designed to help protect eyes from too much sunlight. “Good” sunglasses screen out 75-90% of visible light. Put on a pair of sunglasses and look in a mirror. If you can see your eyes easily, your sunglasses might be too light. Eyes are extremely light sensitive and can be easily damaged by overexposure to radiation in the visible and non-visible spectra. While bright sunlight can be a distracting annoyance, extended exposure can cause soreness, headaches and permanent damage to the lens, retina and cornea of your eyes! Short-term effects of sun overexposure include temporary reduction in vision, known as snow blindness. Long-term effects include cataracts and loss of night vision. In both cases, ultraviolet (UV) light causes damage to the eyes because it burns the surface of the cornea. Today’s sunglass manufacturing processes have become increasingly sophisticated in response to demand for high-quality stylish glasses. New coatings and colorants provide better protection against UV radiation. Sunglasses protect our eyes and show our style! Be cool, be smart! Put your shades on! Research the history of sunglasses. When was the first pair of glasses developed? Why did people first start using sunglasses? Investigate and discover why some sunglass brands are famous now and why people prefer a particular brand of sunglasses. Is it because of quality or is it an aesthetic view? Compare those companies’ newest design and production capacities. Does that affect the final price and style? Actually making sunglasses is a good way to explore sunglass design. You will need cardboard, transparent colored plastic or trace paper (pick your shade! ), a pencil, mat knife, cutting board, glue, paint, glitter and any ornaments you can find. 1. Trace, with pencil, the basic shape of a sunglass (front, right and left sides w/ear pieces) in cardboard. 2. Cut out the stencil. Make sure to cut out eyeholes. 3. Draw lines where the cardboard should bend in order to fit your head. Trial and error will give you the best fit. 4. Cut the eyehole shapes out of your transparent plastic or trace paper, leaving a little extra around the edges. These will be your lenses. 5. Paint the cardboard black, white, or whatever color you choose and add the colored ornaments, stickers and patterns! 6. Glue the lens’ cutouts around the eyeholes. 7. Let dry completely before putting back on your head! 8. When finished, go outside, have fashion fun and enjoy the attention from others. Make them for friends! Set the trend! 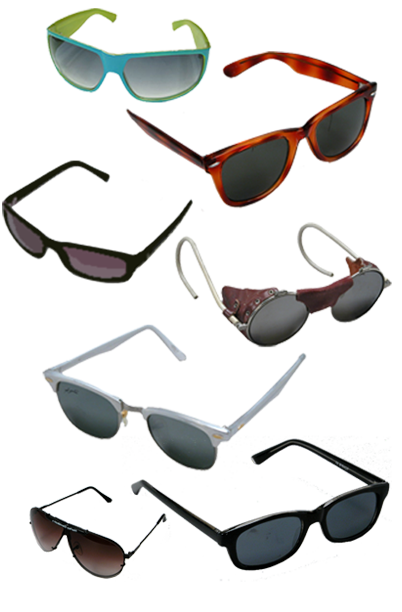 polarized: lenses that bounce sunlight off ; polarized lenses also need to have UV protection. mirror coatings: metallic coatings that reflect light without guaranteeing UV protection. Design protective and fashionable sunglasses for the future. Bring out your imagination and present your most outstanding ideas to people. If you are a sunglass designer in the future, what kinds of materials will you use and what design will be loved? New types of high performance sun-protective eyewear will be developed as advances are made in the fields of optics, surfaces chemistry, metallurgy and other sciences. Don’t forget, it is all about protection and design. Bring out your imagination and present your most outstanding ideas to people. Did you know that buildings need sunglasses too? Most buildings have two to four facades, or sides. One or more of those facades very likely face south. In this hemisphere, the sun rises in the east and sets in the west shining on the south facing side of buildings. People inside of buildings are warmed, and sometimes overheated, by the direct heat gain of sunlight. While interior architects might add shutters, curtains, blinds or shades on the inside of the windows, many architects are now designing sun screens for south facades. The French word, ‘bris soleil’ means sunshade. Sunshades for buildings come in many materials and many styles. Common materials are aluminum, tinted glass, wood and light steel. Often their expression is similar to sunglasses that people wear. Some are curved, others are angular. Some are fixed while others open and close. Look for examples of sunshades in your city. Once you have looked at several different types of sunshades and made sketches and taken notes in your journal, try being a sunshade designer. Print pictures of buildings without sunshades and add some in. Consider material, amount of overhead, connection to the building. Decide whether the shade is to be fixed or will open and close by pivoting, sliding, or contracting and expanding. Experiment with different expressions. Architects who design sunshades work closely with engineers to understand the heating and cooling benefits the shades provide. Collage a sunshade by cutting strips of aluminum foil, gluing on thin wood pieces, drawing in the forms. Buildings wear their sunglasses at night, too! What causes damage to our eyes? Which is a symptom from serious over-exposure to light? Why do people like to buy expensive sunglasses? The more expensive the sunglasses, the more UV they filter.